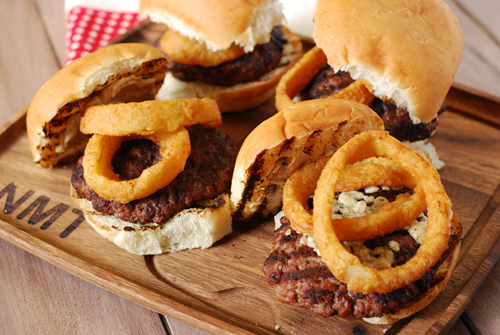 Warm summer evenings and juicy grilled burgers are a hard to beat combo, don't you think? While a classic burger with lettuce, onion, tomato and cheese will always be a favorite, I'm sure you have noticed a few trends with grilled burgers over the past few years. Stuffed, "inside out" or "jucy lucy" [sic] burgers are all the rage. Layers of big bold flavors are also hot. I tried to do a bit of both in this burger. Crispy onion rings layer on top of the onion burger seasoning and the beefy mayo enhances the great taste of the burger. The blue cheese tucked in the middle just makes sure the taste party keeps on going. Thoroughly mix together the mayo, 5 Pepper seasoning, and beef base. It is best if you have an hour or two to let it chill in the fridge. Preheat your grill to medium-high (450f). Make sure your grill grates are clean and lightly coated with oil. At the same time, preheat your oven and cook the onion rings according to package instructions. Mix together the beef and burger seasoning, being careful to evenly distribute the seasoning but don't overwork the beef. Divide into 8 equal portions (3 oz each) and form into thin 4" patties. Toast your buns on the grill (about 13-20 seconds). 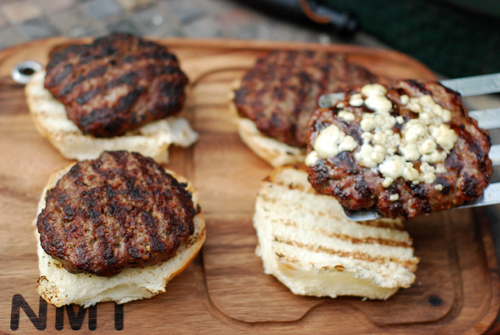 Grill the burgers until they reach an internal temperature of 160f, about 4-6 minutes per side. 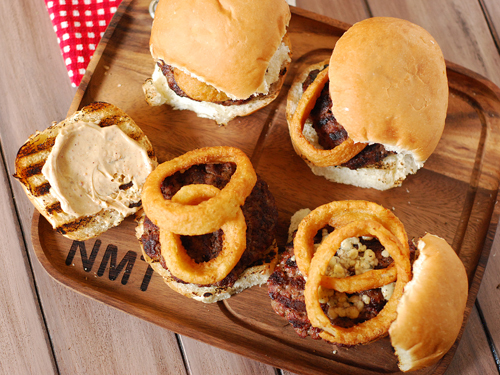 Serve the burgers topped with a pair of onion rings and the buns slathered with the steakhouse mayo. 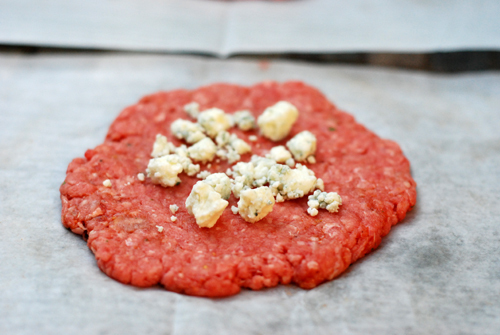 Alternate burger method - If you don't feel like bothering with the stuffed burger, make four 6-oz patties instead. 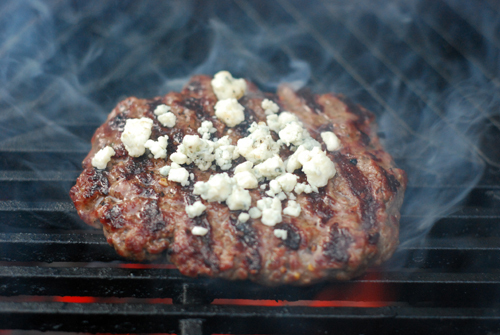 Then when you flip the patties on the grill, top with the crumbled blue cheese. They seem thin here, but the second patty on top makes it a big burger. Burger done using the alternate "non-stuffed-in-the-middle" method. The other three have the cheese hiding inside. These were probably the best burgers we've done this year. Trevor told me three times how great they were. Who is in your Grillerhood? You know....your neighbors, family and friends who share your passion for pryo and fanaticism for flame. This is my third year working with the Grill Mates line of seasonings and I always expect exciting and innovative flavors from them. 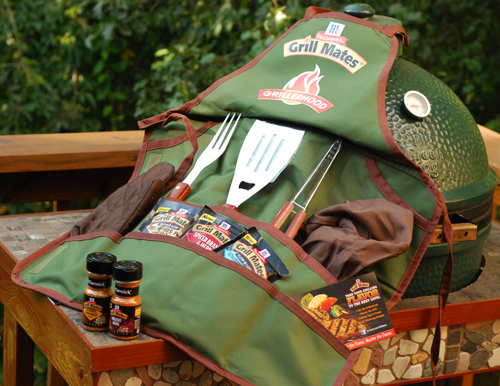 But this year they have added something new - The Grillerhood. It's a place to get tips, rewards, grilling recipes, exclusive contests, and other info. 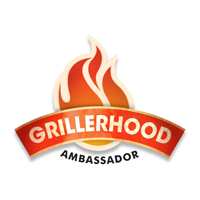 In the Grillerhood you can interact online and real time with other grillers, sharing new and bold techniques. 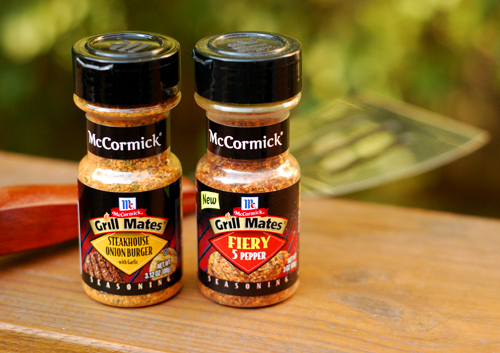 [Standard Disclaimer] I have a business arrangement with McCormick to promote their Grill Mates line of grilling and BBQ seasonings and marinades.